David Bainbridge Electricians & Supplies With over 40 years of experience, David Bainbridge undertakes all types of domestic and commercial electrical projects. Whether you want your house rewired or need emergency lighting for your commercial establishment, we can help. Our prices are highly competitive and we serve across Newcastle. We offer customised electrical solutions. From socket or switch replacements to electrical surveys and testing, we undertake all types of projects within a 10-mile radius of Whitley Bay. 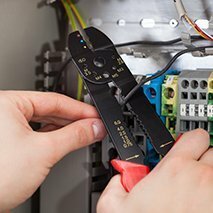 Our technicians will advise you on what electrical parts are needed and how you can ensure that your electrical systems are safe. Contact us for details. We have a huge stock of all types of electrical supplies. From small switches and sockets to electrical showers and decorative accessories, we have it all. Contact our electrical trade counter to order electrical parts today. We also sell electrical items on eBay.